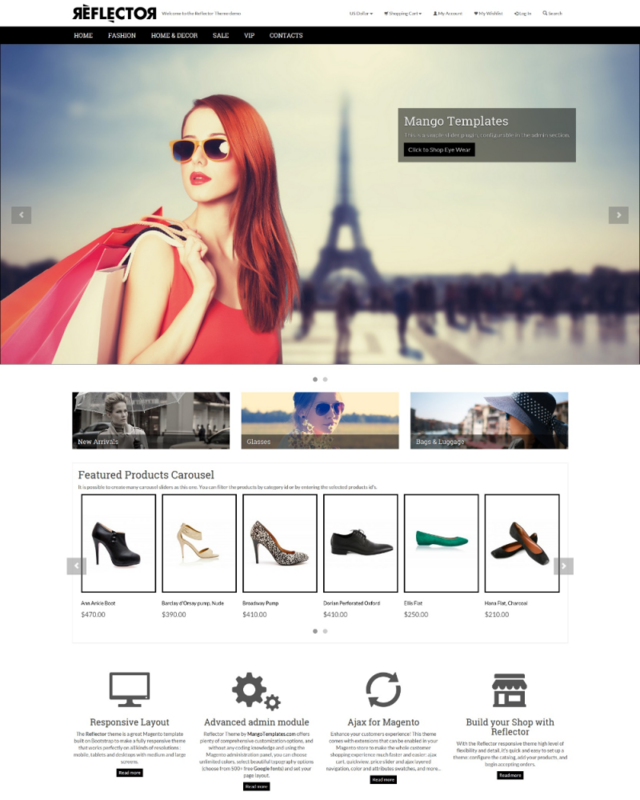 Reflector is a powerful, elegant and fully responsive theme for Magento, ideal for selling any type of product, it is suitable for all types of e-commerce websites: apparel, jewellery, cosmetics or electronics. The Reflector theme lets you build your homepage slideshow, display quick view popups, modify the website layout, colors, fonts and personalize your Magento based website. The Reflector Theme for Magento is a highly-customizable Ajax-enabled responsive theme based on the Twitter Bootstrap framework. In addition to having many configurable options and layouts, more competent users can take advantage of Bootstrap to use the Reflector theme for Magento as a base for more advanced custom themes. The Reflector Theme for Magento 1.7, 1.8 and 1.9 is designed to make it quick & easy to browse through all the categories and products your store has to offer. A variety of awesome features including Ajax add-to-cart, quick-view, product image zoom, Ajax layered navigation with price slider, color swatches and more. 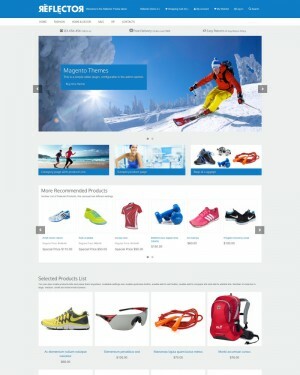 We have moved our shop from Magento 1.3 to 1.9 and we took the opportunity to renew the front-end theme. We have selected Reflector for its great look, for the configuration possibilities and for a correct price. We have been able to tune the theme to our wishes. A lot of configurations are available in the back-end. The theme is well build, it can be easily adapted. We are 100% satisfied. A special thanks to the support team for their fast responses, for their advises, for their help in fine tuning the theme. The support is great and FIRST CLASS.